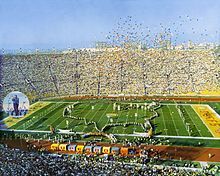 The first AFL-NFL World Championship Game in professional American football, known retroactively as Super Bowl I and referred to in some contemporaneous reports, including the game's radio broadcast, as the Super Bowl, was played on January 15, 1967 at the Los Angeles Memorial Coliseum in Los Angeles, California. The National Football League (NFL) champion Green Bay Packers defeated the American Football League (AFL) champion Kansas City Chiefs by the score of 35–10. Coming into this game, considerable animosity existed between the AFL and NFL, thus the teams representing the two rival leagues (Kansas City and Green Bay, respectively) felt pressure to win. The Chiefs posted an 11–2–1 record during the 1966 AFL season, and defeated the Buffalo Bills 31–7, in the AFL Championship Game. The Packers finished the 1966 NFL season at 12–2, and defeated the Dallas Cowboys 34–27 in the NFL Championship Game. Still, many sports writers and fans believed any team in the older NFL was vastly superior to any club in the upstart AFL, and so expected Green Bay would blow out Kansas City. The first half of Super Bowl I was competitive, as the Chiefs outgained the Packers in total yards, 181–164, to come within 14–10 at halftime. Early in the 3rd quarter, Green Bay safety Willie Wood intercepted a pass and returned it 50 yards to the 5-yard line. The turnover sparked the Packers to score 21 unanswered points in the second half. Green Bay quarterback Bart Starr, who completed 16 of 23 passes for 250 yards and two touchdowns, with 1 interception, was named MVP. It remains the only Super Bowl to have been simulcast in the United States by two networks. NBC had the rights to nationally televise AFL games, while CBS held the rights to broadcast NFL games; both networks were allowed to televise the game. The 1st Super Bowl's entertainment consisted of college marching bands from the University of Arizona and Grambling State University, instead of featuring popular singers and musicians as in later Super Bowls. When the NFL began its 40th season in 1960, it had a new and unwanted rival: the American Football League. The NFL had successfully fended off several other rival leagues in the past, and so the older league initially ignored the new upstart and its 8 teams, figuring it would be made up of nothing but NFL rejects, and that fans were unlikely to prefer it to the NFL. But unlike the NFL's prior rivals, the AFL survived and prospered, in part by signing "NFL rejects" who turned out to be highly talented players the older league had badly misjudged. Soon the NFL and AFL found themselves locked in a massive bidding war for the top free agents and prospects coming out of college. Originally, there was a tacit agreement between the two not to raid each other by signing players who were already under contract with a team from an opposing league. This policy broke down in early 1966 when the NFL's New York Giants signed Pete Gogolak, a placekicker who was under contract with the AFL's Buffalo Bills. The AFL owners considered this an "act of war" and immediately struck back, signing several contracted NFL players, including 8 of their top quarterbacks. Eventually the NFL had enough and started negotiations with the AFL in an attempt to resolve the issue. As a result of the negotiations, the leagues signed a merger agreement on June 9, 1966. Among the details, both leagues agreed to share a common draft in order to end the bidding war for the top college players, as well as merge into a single league after the 1969 season. In addition, an "AFL-NFL World Championship Game" was established, in which the AFL and NFL champions would play against each other in a game at the end of the season to determine which league had the best team. Los Angeles wasn't awarded the game until December 1, less than seven weeks prior to the kickoff; likewise, the date of the game was not set until December 13. Since the AFL Championship Game originally was scheduled for Monday, December 26, and the NFL Championship Game for Sunday, January 1 (the reverse of the situation following the 1960 season), the "new" championship game was suggested to be played Sunday, January 8. Eventually, an unprecedented TV doubleheader was held on January 1, with the AFL Championship Game telecast from Buffalo starting at 1 p.m. EST on NBC and the NFL Championship Game telecast from Dallas starting at 4 p.m. EST (3 p.m. CST) on CBS. Coming into this "first" game, considerable animosity still existed between the two rival leagues, with both of them putting pressure on their respective champions to trounce the other and prove each league's dominance in professional football. Still, many sports writers and fans believed the game was a mismatch, and any team from the long-established NFL was far superior to the best team from the upstart AFL. The Green Bay Packers played the Kansas City Chiefs, with the Packers winning 35–10. The players' shares were $15K each for the winning team and $7,500 each for the losing team. This was in addition to the league championship money earned two weeks earlier: the Packers shares were $8,600 each, and the Chiefs were $5,308 each. The Chiefs entered the game after recording an 11–2–1 mark during the regular season. In the AFL championship game, they defeated the Buffalo Bills 31–7. Kansas City's high-powered offense led the AFL in points scored (448) and total rushing yards (2,274). Their trio of running backs, Mike Garrett (801 yards), Bert Coan (521 yards), and Curtis McClinton (540 yards) all ranked among the top-ten rushers in the AFL. Quarterback Len Dawson was the top-rated passer in the AFL, completing 159 of 284 (56%) of his passes for 2,527 yards and 26 touchdowns. Wide receiver Otis Taylor provided the team with a great deep threat by recording 58 receptions for 1,297 yards and eight touchdowns. Receiver Chris Burford added 58 receptions for 758 yards and eight touchdowns, and tight end Fred Arbanas, who had 22 catches for 305 yards and four touchdowns, was one of six Chiefs offensive players who were named to the All-AFL team. The Chiefs also had a strong defense, with All-AFL players Jerry Mays and Buck Buchanan anchoring their line. Linebacker Bobby Bell, who was also named to the All-AFL team, was great at run stopping and pass coverage. The strongest part of their defense, though, was their secondary, led by All-AFL safeties Johnny Robinson and Bobby Hunt, who each recorded 10 interceptions, and defensive back Fred Williamson, who recorded four. Their head coach was Hank Stram. The Packers were an NFL dynasty, turning around what had been a losing team just 8 years earlier. The team had posted an NFL-worst 1–10–1 record in 1958 before legendary head coach Vince Lombardi was hired in January 1959. "Their offense was like a conga dance," one sportswriter quipped. "1, 2, 3 and kick." Lombardi was determined to build a winning team. During the preseason, he signed Fred "Fuzzy" Thurston, who had been cut from three other teams, but ended up becoming an All-Pro left guard for Green Bay. In addition Lombardi also made a big trade with the Cleveland Browns that brought three players to the team who would become cornerstones of the defense: linemen Henry Jordan, Willie Davis, and Bill Quinlan. Lombardi's hard work paid off, and the Packers improved to a 7–5 regular season record in 1959. They surprised the league during the following year by making it all the way to the 1960 NFL Championship Game. Although the Packers lost 17–13 to the Philadelphia Eagles, they had sent a clear message that they were no longer losers. Green Bay went on to win NFL Championships in 1961, 1962, 1965, and 1966. Packers veteran quarterback Bart Starr was the top-rated quarterback in the NFL for 1966, and won the NFL Most Valuable Player Award, completing 156 of 251 (62.2%) passes for 2257 yards (9.0 per attempt), 14 touchdowns, and only 3 interceptions. His top targets were wide receivers Boyd Dowler and Carroll Dale, who combined for 63 receptions for 1,336 yards. Fullback Jim Taylor was the team's top rusher with 705 yards, adding 4 touchdowns, and caught 41 passes for 331 yards and 2 touchdowns. (Before the season, Taylor had informed the team that instead of returning to the Packers in 1967, he would become a free agent and sign with the expansion New Orleans Saints. Lombardi, infuriated at what he considered to be Taylor's disloyalty, refused to speak to Taylor the entire season.) The team's starting halfback, Paul Hornung, was injured early in the season, but running back Elijah Pitts, a replacement, gained 857 all purpose yards. The Packers' offensive line was also a big reason for the team's success, led by All-Pro guards Jerry Kramer, and Fuzzy Thurston, and tackle Forrest Gregg. Green Bay also had an excellent defense that displayed their talent in the NFL championship game, stopping the Dallas Cowboys on four consecutive plays starting from the Packers 2-yard line on the final drive to win the game. Lionel Aldridge had replaced Quinlan, but Jordan and Davis still anchored the defensive line; linebacker Ray Nitschke excelled at run stopping and pass coverage, while the secondary was led by defensive backs Herb Adderley and Willie Wood. Wood was another example of how Lombardi found talent in players that nobody else could see. Wood had been a quarterback in college and was not drafted by an NFL team. When Wood joined the Packers in 1960, he was converted to a free safety, and went on to make the All-Pro team 9 times in his 12-year career. Many people considered it fitting that the Chiefs and the Packers would be the teams to play in the first ever AFL-NFL World Championship Game. Chiefs owner Lamar Hunt had founded the AFL, while Green Bay was widely considered one of the better teams in NFL history (even if they could not claim to be founding members of their own league, as the Packers joined the NFL in 1921, a year after the league's formation). Lombardi was under intense pressure from the entire NFL to make sure the Packers not only won the game, but preferably won big to demonstrate the superiority of the NFL. CBS announcer Frank Gifford, who interviewed Lombardi prior to the game, said Lombardi was so nervous, "he held onto my arm and he was shaking like a leaf. It was incredible." The Chiefs saw this game as an opportunity to show they were good enough to play against any NFL team. One player who was really looking forward to competing in this game was Len Dawson, who had spent three years as a backup in the NFL before joining the Chiefs. However, the Chiefs were also nervous. Linebacker E. J. Holub said, "the Chiefs were scared to death. Guys in the tunnel were throwing up." In the week prior to the game, Chiefs cornerback Fred "The Hammer" Williamson garnered considerable publicity by boasting he would use his "hammer" – forearm blows to the head – to destroy the Packers' receivers, stating, "Two hammers to (Boyd) Dowler, one to (Carroll) Dale should be enough." His prediction turned out to be partially correct as Dowler was knocked out of the game early in the first quarter (although it was because of an exacerbation of an injury he had previously received during the NFL Championship game in Dallas on January 1). However, Willamson himself was knocked out cold and carried off the field on a stretcher near the end of the game. The two teams played with their respective footballs from each league; the Chiefs used the AFL ball, the slightly narrower and longer J5V by Spalding, and the Packers played with the NFL ball, "The Duke" by Wilson. The AFL's two-point conversion rule was not in force; the NFL added the two-point conversion in 1994 and it was first used in the Super Bowl that same season, Super Bowl XXIX in January 1995. Justin Peters of Slate watched all the Super Bowls over a 2-month period in 2015 before Super Bowl 50. He mentioned about the first Super Bowl having "two dudes in rocket packs who flew around the stadium. I can forgive a lot of bad football as long as the game features two dudes in honest-to-God rocket packs." The game was played in a stadium. The temperature was mild with clear skies. This game is the only Super Bowl to have been broadcast in the United States by two television networks simultaneously (no other NFL game was subsequently carried nationally on more than one network until December 29, 2007, when the New England Patriots faced the New York Giants on NBC, CBS, and the NFL Network). At the time, NBC held the rights to nationally televise AFL games while CBS had the rights to broadcast NFL games. Both networks were allowed to cover the game. During the week, tensions flared between the staffs of the two networks (longtime arch-rivals in American broadcasting), who each wanted to win the ratings war, to the point where a fence was built between the CBS and NBC trucks. Each network used its own announcers: Ray Scott (doing play-by-play for the first half), Jack Whitaker (doing play-by-play for the second half) and Frank Gifford provided commentary on CBS, while Curt Gowdy and Paul Christman were on NBC. While Rozelle allowed NBC to telecast the game, he decreed it would not be able to use its cameramen and technical personnel, instead forcing it to use the feed provided by CBS, since the Coliseum was home to the NFL's Rams. Super Bowl I was the only Super Bowl in history that was not a sellout in terms of attendance, despite a TV blackout in the Los Angeles area (at the time, NFL games were required to be blacked out in the market of origin, even if it was a neutral site game and if it sold out). Of the 94,000-seat capacity in the Coliseum, 33,000 went unsold. Days before the game, local newspapers printed editorials about what they viewed as a then-exorbitant $12 price for tickets, and wrote stories about how viewers could pull in the game from stations in surrounding markets such as Bakersfield, Santa Barbara and San Diego. All known broadcast tapes of the game in its entirety were subsequently wiped by both NBC and CBS to save costs, a common practice in the TV industry at the time as videotapes were very expensive (one 30 minute tape cost around $300 at the time, equivelant to $2260 in 2019 dollars), plus it was not foreseen how big the game was going to become. This has prevented studies comparing each network's respective telecast. For many years, only two small samples of the telecasts were known to have survived, showing Max McGee's opening touchdown and Jim Taylor's first touchdown run. Both were shown in 1991 on HBO's Play by Play: A History of Sports Television and on the Super Bowl XXV pregame show. In January 2011, a partial recording of the CBS telecast was reported to have been found in a Pennsylvania attic and restored by the Paley Center for Media in New York. The two-inch color videotape is the most complete version of the broadcast yet discovered, missing only the halftime show and most of the third quarter. The NFL owns the broadcast's copyright and has blocked its sale or distribution. After remaining anonymous and only communicating with the media through his lawyer since the recording's discovery, the owner of the recording, Troy Haupt, came forward to The New York Times in 2016 to tell his side of the story. NFL Films had a camera crew present, and retains a substantial amount of film footage in its archives, some of which has been released in its film productions. One such presentation was the NFL's Greatest Games episode about this Super Bowl, entitled The Spectacle of a Sport (also the title of the Super Bowl I highlight film). On January 11, 2016, the NFL announced that, "in an exhaustive process that took months to complete, NFL Films searched its enormous archives of footage and were able to locate all 145 plays from Super Bowl I from more than a couple dozen disparate sources. Once all the plays were located, NFL Films was able to put the plays in order and stitch them together while fully restoring, re-mastering, and color correcting the footage. Finally, audio from the NBC Sports radio broadcast featuring announcers Jim Simpson and George Ratterman was layered on top of the footage to complete the broadcast. The final result represents the only known video footage of the entire action from Super Bowl I." It then announced that NFL Network would broadcast the newly pieced together game footage in its entirety on January 15, 2016–the 49th anniversary of the contest. This footage was nearly all on film with the exception of several player introductions and a post game locker room chat between Pat Summerall and Pete Rozelle. The Los Angeles Ramettes, majorettes who had performed at all Rams home games, entertained during pregame festivities and after each quarter. Also during the pregame, the University of Arizona band created a physical outline of the continental United States at the center of the field, with the famed Anaheim High School drill team placing banners of each NFL and AFL team at each team's geographical location. The halftime show featured trumpeter Al Hirt, the marching bands from the University of Arizona and Grambling State University, 300 pigeons, 10,000 balloons and a flying demonstration by the hydrogen-peroxide-propelled Bell Rocket Air Men. The postgame trophy presentation ceremony was handled by CBS' Pat Summerall and NBC's George Ratterman. Summerall and Ratterman were forced to share a single microphone. During the game, the official balls from both leagues were used – when the Chiefs were on offense, the official AFL football (Spalding JV-5) was used, and when the Packers were on offense, the official NFL ball (Wilson's "The Duke") was used. Even the officiating crew was made up of a combination of AFL and NFL referees, with the NFL's Norm Schachter as the head referee. After both teams traded punts on their first possessions of the game, the Packers jumped out to an early 7–0 lead, driving 80 yards in six plays. The drive was highlighted by Starr's passes, to Marv Fleming for 11, to Elijah Pitts for 22 yards on a scramble, and to Carroll Dale for 12 yards. On the last play, Bart Starr threw a pass to reserve receiver Max McGee, who had replaced re-injured starter Boyd Dowler earlier in the drive. (Dowler had injured his shoulder the previous week after scoring a third quarter touchdown; Cowboys defensive back Mike Gaechter had upended him several steps after scoring and he landed awkwardly.) McGee slipped past Chiefs cornerback Willie Mitchell, made a one-handed catch at the 23-yard line, and then took off for a 37-yard touchdown reception (McGee had also caught a touchdown pass after replacing an injured Dowler in the NFL championship game). On their ensuing drive, the Chiefs moved the ball to Green Bay's 33-yard line, but kicker Mike Mercer missed a 40-yard field goal. Early in the second quarter, Kansas City drove 66 yards in six plays, featuring a 31-yard reception by receiver Otis Taylor, to tie the game on a seven-yard pass to Curtis McClinton from quarterback Len Dawson. But the Packers responded on their next drive, advancing 73 yards down the field and scoring on fullback Jim Taylor's 14-yard touchdown run with the team's famed "Power Sweep" play. Taylor's touchdown run was the first in Super Bowl history. This drive was again highlighted by Starr's key passes. He hit McGee for 10 yards on third and five; Dale for 15 on third and ten; Fleming for 11 on third and five; and Pitts for 10 yards on third and seven to set up Taylor's TD on the next play. Dawson was sacked for an eight-yard loss on the first play of the Chiefs' next drive, but he followed it up with four consecutive completions for 58 yards, including a 27-yarder to Chris Burford. This set up Mercer's 31-yard field goal to make the score 14–10 at the end of the half. At halftime, the Chiefs appeared to have a chance to win. Many people watching the game were surprised how close the score was and how well the AFL's champions were playing. Kansas City actually outgained Green Bay in total yards, 181–164, and had 11 first downs compared to the Packers' 9. The Chiefs were exuberant at halftime. Hank Stram said later, "I honestly thought we would come back and win it." The Packers were disappointed with the quality of their play in the first half. "The coach was concerned", said defensive end Willie Davis later. Lombardi told them the game plan was sound, but that they had to tweak some things and execute better. On their first drive of the second half, the Chiefs advanced to their own 49-yard line. But on a third-down pass play, a heavy blitz by linebackers Dave Robinson and Lee Roy Caffey collapsed the Chiefs pocket. Robinson, tackle Henry Jordan, and Packer right end Lionel Aldridge converged on Dawson who threw weakly toward tight end Fred Arbanas. The wobbly pass was intercepted by Willie Wood. Wood raced 50 yards to Kansas City's five-yard line where Mike Garrett dragged him down from behind. This was "the biggest play of the game," wrote Starr later. On their first play after the turnover, running back Elijah Pitts scored on a five-yard touchdown run off left tackle to give the Packers a 21–10 lead. Stram agreed that it was the critical point of the game. The Packers defense then dominated the Chiefs offense for the rest of the game, only allowing them to cross midfield once, and for just one play. The Chiefs were forced to deviate from their game plan, and that hurt them. The Kansas City offense totaled only 12 yards in the third quarter, and Dawson was held to five of 12 second-half pass completions for 59 yards. Meanwhile, Green Bay forced Kansas City to punt from their own two-yard line after sacking Dawson twice and got the ball back with good field position on their own 44-yard line (despite a clipping penalty on the punt return). McGee subsequently caught three passes for 40 yards on a 56-yard drive. Taylor ran for one first down, Starr hit McGee for 16 yards on third-and-11, and a third down sweep with Taylor carrying gained 8 yards and a first down at the Kansas City 13. The drive ended with Starr's 13-yard touchdown toss to McGee on a post pattern. Midway through the fourth quarter, Starr completed a 25-yard pass to Carroll Dale and a 37-yard strike to McGee, moving the ball to the Chiefs 18-yard line. Four plays later, Pitts scored his second touchdown on a one-yard run to close out the scoring, giving the Packers the 35–10 win. Also in the fourth quarter, Fred Williamson, who had boasted about his "hammer" prior to the game, was knocked out when his head collided with running back Donny Anderson's knee, and then suffered a broken arm when Chiefs linebacker Sherrill Headrick fell on him. Williamson had three tackles for the game. Hornung was the only Packer not to see any action. Lombardi had asked him in the fourth quarter if he wanted to go in, but Hornung declined, not wanting to aggravate a pinched nerve in his neck. McGee, who caught only four passes for 91 yards and one touchdown during the season, finished Super Bowl I with seven receptions for 138 yards and two touchdowns. After the game was over, a reporter asked Vince Lombardi about if he thought Kansas City was a good team. Lombardi responded that though the Chiefs were an excellent, well-coached club, he thought several NFL teams such as Dallas were better. Note: According to NBC Radio announcer Jim Simpson's report at halftime of the game, Kansas City led 11 to 9 in first downs at halftime, 181 to 164 in total yards, and 142 to 113 in passing yards (Green Bay led 51 to 39 in rushing yards). Bart Starr completed eight of 13 with no interceptions, while Len Dawson was 11 of 15 with no interceptions. Green Bay led 14–10 at halftime. Green Bay had the ball five times, although only for a minute or so on the last possession; they punted on their first possession, scored a touchdown on their second, punted on their third, scored a touchdown on their fourth, and had the ball when the half ended on their fifth. Kansas City had the ball four times – punting on their first possession, driving to a missed field goal on their second possession, scoring a touchdown on their third, and kicking a field goal on their fourth. This means, in the second half, Green Bay led 12 to six in first downs, 197 to 58 in total yards, 115 to 25 in passing yards, and 82 to 33 in rushing yards (the Packers won the second half, 21–0). Starr and his late-game replacement, Zeke Bratkowski, were eight for 11 with one interception; Dawson and his late-game replacement, Pete Beathard, were just six for 17, also with one interception. Each team had the ball seven times in the second half, although Green Bay's first possession was just one play and their seventh possession was abbreviated because the game ended. Green Bay scored a touchdown on their first (one play) possession, punted on their second, scored a touchdown on their third, was intercepted at KC's 15-yard line on their fourth (just Starr's fourth interception of the year), scored a touchdown on their fifth, punted on their sixth, and had the ball when the game ended on their seventh possession. Kansas City was intercepted on their first possession – Wood's return to the five set up Pitts' touchdown that made the score 21–10 – and then punted on each of their next six possessions. Because this was the first Super Bowl, a new record was set in every category. All categories are listed in the 2016 NFL Fact book. The following records were set in Super Bowl I, according to the official NFL.com boxscore and the Pro-Football-Reference.com game summary. ‡ Sacks an official statistic since Super Bowl XVII by the NFL. Sacks are listed as "Tackled Attempting to Pass" in the official NFL box score for Super Bowl I. Note: A six-official system was used by the NFL from 1965 through the 1977 season. Since officials from the NFL and AFL wore different uniform designs, a "neutral" uniform was designed for this game. These uniforms had the familiar black and white stripes, but the sleeves were all black with the official's uniform number. This design was also worn in Super Bowl II, but was discontinued after that game when AFL officials began wearing uniforms identical to those of the NFL during the 1968 season, in anticipation of the AFL-NFL merger in 1970. ^ "Super Bowl Winners". NFL.com. Retrieved February 4, 2015. ^ "Super Bowl – Entertainment". National Football League. Retrieved February 6, 2016. ^ a b c Beschloss, Michael (January 24, 2015). "Before the Bowl Was Super". New York Times. Retrieved June 9, 2015. ^ a b c d "Historical Super Bowl Nielsen TV Ratings, 1967–2009 – Ratings". TVbytheNumbers. January 18, 2009. Retrieved October 10, 2012. ^ MacCambridge, Michael (February 4, 2011). "Five myths about the Super Bowl". The Washington Post. Retrieved January 15, 2016. ^ Felser, Larry (2008). Birth of the New NFL: How the 1966 NFL/AFL Merger Transformed Pro Football. Guilford, CT: Lyons Press. p. 31. ISBN 978-1-59921-762-8. ^ Gruver, Ed (1997). The American Football League: A Year-by-Year History, 1960–1969. Jefferson, NC: McFarland. p. 218. ISBN 0-7864-0399-3. ^ a b Kuechle, Oliver E. (January 16, 1967). "Interception vital". Milwaukee Journal. p. 15, part 2. ^ a b "Wood's steal changed our plans: Stram". Milwaukee Sentinel. UPI. January 16, 1967. p. 1, part 2. ^ a b Clines, Frank (August 3, 1989). "Wood shrugs off interception". Milwaukee Journal. p. 6C. ^ a b c "Football's Super Bowl scheduled Jan. 15 at Los Angeles". Lewiston Morning Tribune. (Idaho). December 14, 1966. p. 10. ^ a b Rappoport, Ken (2010). The Little League That Could: A History of the American Football League. Lanham, MD: Taylor Trade Publishing. ISBN 978-1589794627. ^ "Football's Super Bowl game will be played at Los Angeles". Lewiston Morning Tribune. (Idaho). December 2, 1966. p. 16. ^ "Super Bowl History". Nfl.com. Retrieved October 10, 2012. ^ "Record team payoff seen for grid play". Spokane Daily Chronicle. (Washington). Associated Press. December 2, 1966. p. 14. ^ "Starr guns Packers to wild title victory". Spokesman-Review. (Spokane, Washington). Associated Press. January 2, 1967. p. 16. ^ "Chiefs ready for Packers". Lawrence Daily Journal-World. Kansas. Associated Press. January 2, 1967. p. 14. ^ "K.C. splits pot 51 ways". Lawrence Daily Journal-World. Kansas. January 2, 1967. p. 14. ^ "1966 Kansas City Chiefs". pro-football-reference.com. Retrieved June 9, 2015. ^ "1966 Green Bay Packers". pro-football-reference.com. Retrieved June 9, 2015. ^ Kevin Jackson, Jeff Merron & David Schoenfield. "100 Greatest Super Bowl Moments". espn.com. Retrieved June 9, 2015. ^ Merron, Jeff. "The Biggest Super Bowl Goats". espn.com. ESPN. Retrieved June 9, 2015. ^ "Super Bowl History: San Francisco 49ers 49 vs. San Diego Chargers 26". pro-football-reference.com. Retrieved June 9, 2015. ^ Peters, Justin (February 4, 2016). "Every Super Bowl, Ranked". Slate. Retrieved February 12, 2016. ^ "Los Angeles, CA (90037) Weather History for January 15th, 1967". ^ Myslenski, Skip (January 26, 1986). "Super Bowl I: CBS vs. NBC". Chicago Tribune. Retrieved February 10, 2013. ^ a b Deninger, Dennis (2012). Sports on Television: The how and why Behind what You See. New York: Taylor & Francis. ISBN 978-0415896757. ^ a b "10 Things You May Not Know About the First Super Bowl". ^ Evan Weiner (February 3, 2011). "Vince Lombardi wanted no part of the Super Bowl". The Sports Digest. Retrieved February 22, 2012. ^ a b c David Roth; Jared Diamond (February 5, 2011). "Found at Last: A Tape of the First Super Bowl". Wall Street Journal. ^ Sandomir, Richard (February 2, 2016). "Out of a Rare Super Bowl I Recording, a Clash With the N.F.L. Unspools". The New York Times. ISSN 0362-4331. Retrieved February 3, 2016. ^ Hill, Jeffrey (February 3, 2008). "Winning Is Gut Pride: A Look at the NFL Super Bowl Films". Slant Magazine. Retrieved June 9, 2015. ^ "NFL Network to re-air Super Bowl I for first time". National Football League. January 11, 2016. Retrieved January 13, 2016. ^ News, A. B. C. (February 6, 2016). "The Story Behind Super Bowl I". ABC News. ^ a b Glazer, Jay (August 7, 2008). "Packers trade Favre to Jets". Fox Sports. Archived from the original on August 22, 2008. Retrieved August 7, 2008. ^ "Best of AFL Inferior, Says Lombardi". Chicago Tribune. January 16, 1967. Retrieved October 3, 2016. ^ "Super Bowl Game-Time Temperatures". Pro Football Hall of Fame. Retrieved June 24, 2018. ^ a b "2016 NFL Factbook" (PDF). NFL. Retrieved November 7, 2016. ^ a b "Super Bowl I boxscore". NFL.com. Retrieved November 7, 2016. ^ a b c d "Super Bowl I statistics". Pro-Football-Reference.com. Retrieved November 6, 2016. ^ "List officials for big pro game today". Chicago Tribune. Associated Press. January 15, 1967. p. 2, sec. 2. ^ " ". The Terre-Haute Tribune from Terre Haute, Indiana on January 15, 1967, page 56. The Terre-Haute Tribune. Retrieved January 29, 2017. ^ "American Football League: On Field Officials". remembertheafl.com. Retrieved June 9, 2015. ^ Brulia, Tim (February 2012). "Super Bowl Trivia Answers". The Gridiron Uniform Database. Retrieved June 9, 2015.